ROOK: Grow a plant in an eggshell! 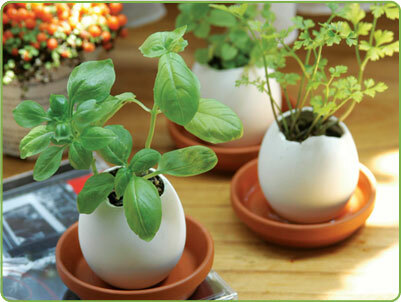 Grow a plant in an eggshell! Have you ever seen Egglings? They are possibly the most adorable things ever! I used to give them as housewarming gifts (I stocked up) but I have run out of my stash! Basically they consist of a porcelain "egg" with a flat bottom (with a drainage gauze) filled with soil. You crack the egg open as though you were going to eat it, sprinkle the seeds on and water from the bottom using the terracotta saucer. They work like a charm. It's now getting close to Easter and I had though of doing this as a DIY, but typically I am running late! I figured I didn't quite have enough time to grow something from seed and have more than a few sprouts on the big day. So here's my cheaty method! a small plant or some seeds - herbs or flowers are nice. First you'll need to get that egg outta there! You can either soft boil it and eat it or you can do what I did and blow the egg out (make a hole at one end and a pinhole at the other and blow it out into a bowl). I was blowing several for other Easter-ish things so doing another wasn't a big deal. Now take a pin and punch some drainage holes in the bottom. Now fill it with some potting soil. And plant your little plant in there! I dug this one out of my garden. Remember to keep it watered! Of course, if you were more organized than me, you could plant some seeds in there and grow them! Me too! When I was living in the states it was impossible to find eggcups. They're much easier to get in Australia and Canada (we eat soft boiled eggs right out of them - unless you're Rachel, LOL).